Nutrition plays an important role right from infancy through childhood because it lays down the foundation for a healthy body and mind. Lack of adequate nutrition, skipping breakfast, or a low protein in take in children can affect learning, performance in school and physical health. In the growing years nutrients are used to the maximum and therefore it is essential to take in the right kind of foods. Undernourished children are more likely to catch infections, in addition, healthy eating habits instilled early in childhood are valued life long. To ensure all dietary needs are fulfilled, one can use the food pyramid as a guideline. The food pyramid remains the same as for adults, except that the food quantities are lower. 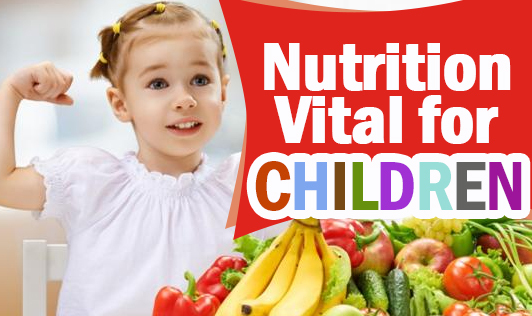 And, to ensure healthy growth in children, one must make sure that the child gets the requisite amount of calories as well as nutrients. Calories provide the fuel or the energy necessary for growth. In general, children in this age group require about 1600 to 2000 calories/day. But remember, this is an approximation and the calorie requirement will vary according to the child's weight, rate of growth and the activity level. Natural foods are always better than supplements since they are rich in many essential nutrients. So make sure you provide a wide variety of foods to your child. It is never too early to emphasise the need for a healthy balanced diet even in children. Avoid junk food since they are filled with calories that have minimal nutrient value and are rich in fat, refined carbohydrates and sugar or salt. Fad diet is note advised in children. Inadequate nutrition can cause deficiencies that can affect learning ability and performance in school. For instance, iron deficiency and anemia can cause fatique, short attention span, and problems in concentrating. Combine good nutrition with sufficient physical activity to ensure healthy growth in children. Provide calcium, iron, calories and protein in adequate quantities for good health. Ensure a well-balanced diet to get all the vitamins and minerals in the required quantities-approximately 250g cereal grains, 60g of pulses or dals, 500ml of milk or curd, 300g of veggies and 100g of fruit per day would provide a good balance of nutrients. Over-indulgence is as harmful as semi-starvation. Ensure the child never misses breakfast. Three healthy meals and two healthy snacks should be the norm.